Listening: to lots of KB thanks to the boys. I like that they can listen to music without a good beat without me having to worry about the lyrics. There's lots of Laurie Berkner and Elizabeth Mitchell thanks to the little threenager. I love the kids eclectic taste in music. Missing: Spring Break. Instead of traveling, we staycationed and acted like tourists in SoCal. Took the kids to Hollywood (where we chanced upon a star with my father's name), got a glimpse of the Hollywood sign and other hot spots. The kids had a ball! Navigating (read refereeing) life between a toddler and tween (and a middle child!). Let's just say that I prefer the toddler tantrums over the tween angst. Listening to LeCrae's Church Clothes 3 thanks to the boys and Jess Ray's Sentimental Creatures which is free on Noisetrade now. Her lyrics are everything. My taste is crazy eclectic, I know. Reading this, and just finished reading this. Watching Season One of This is Life with Lisa Ling on Netflix. She's one of my favorite journalists because she always asks the right questions. Walking like a mad woman thanks to Fitbit challenges that friends invite me to. Enjoying the summer in winter weather we are having in February. It's was 87 degrees the other day and I had to turn the AC on. Researching homeschooling options....that's a whole 'nother talk show. Loving how shiny flaxseed gel is making my little threenager's twists. And it's cheap and easy to make. And one batch makes a bunch. Winner! Enjoying the black history month videos from Nick. So creative and cute. Wanting a trip to Body Time in the Bay Area to replenish my stash of smell goods. Anything new with you? Do share! Just finished reading: Women of the Word by Jen Wilkin. Actually finished it in 2 days! Some good solid info. I especially like her reminder that the Bible is first and foremost a book about God and His dealings with His people--not about us. Next read: Shadow of the Almighty: The Life and Testament of Jim Elliot. Loving: Jen Wilkin's Bible studies. I'm right in the midst of the Joshua study. I really like slowly digesting a book of the Bible at a time. Planning: A trip to Bay Area later this month. My mother has a storage she's getting rid of and I'm going to go raid her goodies! Thinking about: Summer plans for the boys. Summer is when I wish I was a homeschooling mama. I don't take kindly to having to pay for summer camp while we work. Looking forward to: Two-year-old being fully potty trained. She's been in underwear for the past two-three weeks. We've had a few accidents-which is to be expected. Still working on staying dry overnight. Listening to: A whole smattering of things: some old Ben Rector, United Pursuit, Kenny Lattimore. Watching: Loads of iTunes University. I can't believe I didn't know about iTunes U. I'm "taking" an Old Testament History course at Dallas Theological Seminary. Taking = watching via Apple TV and writing notes. And also a Bible Study Methods course. Anything new with you? I'd love to hear in the comments below. Loving: My little girlie's frohawk that she rocked for Easter. I wanted to do something different and it turned out lovely. Lots of compliments. Funny thing is when I told her to go look at herself in the mirror she said, "I look crazy." Finishing Up: Let Me Be a Woman by Elisabeth Elliot. I just have a few pages left and have to decide what to pick next. The decision is overwhelming because I have a stack of books on my nightstand and a bunch of downloaded books on my Kindle. I've decided I want to get back to basics and read some Christian classics so I've downloaded titles by Andrew Murray, Warren Wiersbe, Brother Lawrence, A.W. Tozer. Watching: Born in the Wild. Cannot stop. It's like watching a train wreck. I want to turn away but just can't. Listening to: Erica Campbell's I Luh God. The kids love it. Christians are downing it because it's trap music but I'd rather my kids sing this than CoCo which my first-grader said he's heard many of his classmates singing word for word. When my sister hipped me to the video I was appalled that adults would know this song word for word. Enjoying: the pretty colors of spring. Flowers are in full bloom in our backyard and the jasmine bush in the front yard is so fragrant. Happy: I bought a big container of Chick-fil-A's polynesian sauce for home. My seven year old has been begging me to buy some for him and he eats it whenever we have chicken. Looking forward to: Seeing Celine Dion in Vegas now that she's returned from her hiatus. Praying for God to provide the funds so I can make it a girl's trip with one of my favorite friends. Addicted: to Stella Pop. I downloaded it for the kids and I end up hiding in a corner to play it. I clearly have a problem. 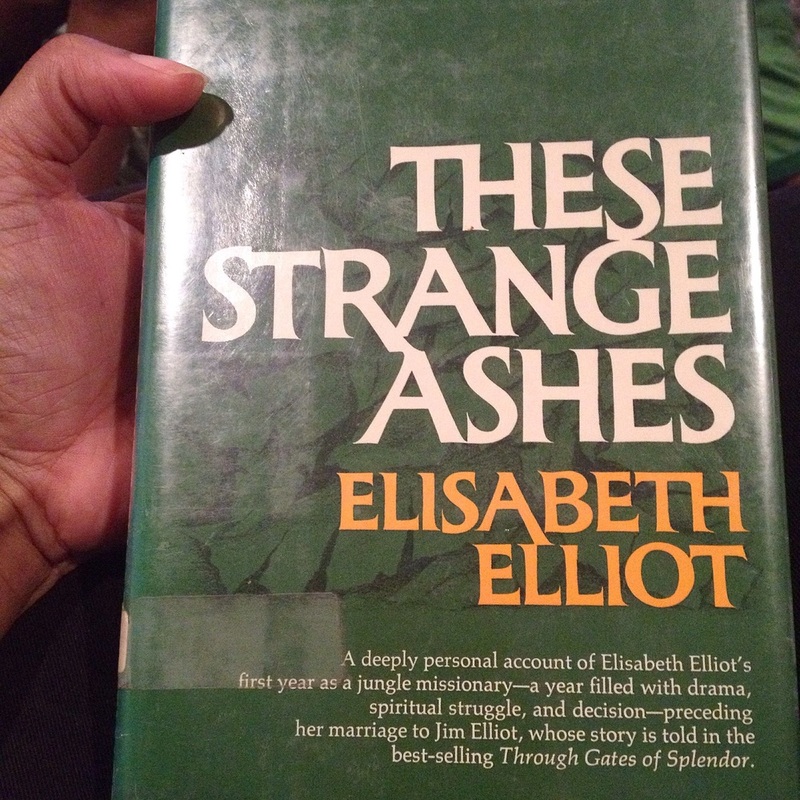 Reading: Two books at once: These Strange Ashes and Let Me Be a Woman by Elisabeth Elliot. I mentioned in my last post how influential her teaching has been in my life and revisiting her work has been refreshing for my soul. I’m especially loving Let Me Be a Woman. It’s a book of “letters” she wrote to her daughter as a wedding gift full of insight and wisdom about womanhood, marriage and home life. Watching: Tons and tons of HGTV. Since I’m a cord cutter, I haven’t been able to watch HGTV except old episodes on Netflix. I recently signed up for a 7-day free trial for Sling TV which is now on Roku that includes the cable channel HGTV among other things. The boys love Disney and Cartoon Network, so I decided to keep it. At $20, it wasn’t’ too much and that brings the total TV bill to $36.That’s manageable compared to the $100+ cable bill we used to have. Listening to: All of the United Pursuit albums. I even created a playlist because the worship is just so sweet to me. My favorite is: Live at the Banks House by Will Reagan and United Pursuit. I just downloaded Virtue’s new album Testimony Reloaded which is playing as I’m typing. And just pre-ordered Tyrone Wells’ new album Roll With It. Four songs came with the pre-order so I’m pretty much in heaven. Loving: my Kate Spade planner. It fits in my purse and keeps me from being a crazy lady (most of the time). Enjoying: The Thru the Bible podcast by Dr. J. Vernon McGee. I’m listening to his through the Bible in five year lessons. He’s now on the book of James. Growing up, my mother used to listen to him religiously. As a kid, I always found his voice comforting during car rides with my mother. Now that I’m grown, I see why she always listened. He has such knowledge about the Word. Shopping: at the Goodwill. Since that middle child of mine likes to wears holes in the knees of perfectly good jeans, I decided jeans from the Goodwill would suffice for his play pants. Little did I know the treasures there. I used to thrift years ago. It looks like the flame has been re-ignited. I’ve found some cute dresses, some brand new items for me and baby girl as well as two pair of almost new Levi’s for her. I stop in regularly now and it might be a borderline addiction. The items below were all $2 each. Can't be that. Loving: the photo of the boys from five years ago that my cousin texted me the other day. Hard to imagine life with just two kids now that there are three. Seems like just yesterday they were that small. Working hard to cherish the days with them now because soon they'll be grown and gone. Watching: Lots of Netflix lately. Enjoyed an indie film over the weekend called Like Father, Like Son. It's the story of switched births and lessons learned. Good, good stuff! I also recently watched Room 335 on Netflix. It's a documentary by Andrew Jenks who moved into a senior living home when he was 19 and what unfolded was unexpected by him and his crew. Heartwarming! I loved it. Looking forward to: another trip to the library. My aim has been to trim my book budget by checking out books at the library. Checked out books for the kids. But after my current read (which is from my personal collection) I'll be heading back to check out some books for myself. Enjoying: Real Simple magazine's Women in Real Life campaign on Instagram. In a world of perfectly posed photos, it's nice to see real life stuff on Instagram. And I can relate to so many of the posts that feature life in all its messy glory. Check out the photos here. Reading: Schulz and Peanuts. After our trip to the Charles M. Schulz museum over the Christmas break, I became more interested in the man behind the comic strip. I've had this book for years and even got through two chapters. But life (or another book got in the way). Picked it back up and am enjoying it again. Thinking about: hiring a private investigator to track down our former housekeeper. Her number is disconnected, I can't remember where her house is and the number she had for us in no longer in service. *sigh* I really need her now. I've prayed to Jesus for her to find me or vice versa. She was a gem! Will keep you all posted on the answer to this prayer. Listening to: Lots of worship music lately: Will Reagan's Set A Fire, Jaye Thomas' Here Is My Worship, and I put Andrae Crouch back in the mix after his death last week. So much of my childhood and spiritual walk was built on his music. Loving: the fact that this little guy is back on track after having his adenoids and tonsils removed right before Thanksgiving. The surgeon said they were humongous. Glad it's taken care of and it's over. We had a few rough days where the pain was bad, but he was a trooper indeed. Reading: Catching up on Kim Cash Tate's blog. Her latest post #BlackStoriesMatter applies to more than just writing. My story matters. Your story matters. Planning: a road trip up the Bay Area after Christmas to visit my mom and family. A visit to the Charles M. Schulz Museum is on our list. We go hard for The Peanuts in this household. Looking forward to: Christmas break. Two glorious weeks of vacation! Listening to: Lots of iTunes radio lately. I've ditched Pandora since iTunes offers 6 skips an hour. Watching: Actually, just finished watching The Red Tent on Lifetime. Good TV still exists. Based on the book, the story is inspired by Dinah, a character in the Bible. People were up in arms that it didn't follow the Bible, but it's inspired by the story not a retelling of the story. What's up with you? I'd love to hear.